On 9th April, the Sensex hit 18,206.61 during the trading day. The index had been falling all the way from 20,203 it hit on 29th January. Remember during January, FIIs (foreign institutional investors) had put in an investment of Rs19,198 crore, the third-highest ever. But instead of heading higher from that point onwards, the market had been declining. FIIs continued to buy during March, even after an insipid Union Budget. 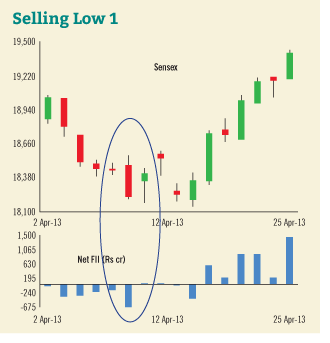 Finally in April, after the market had fallen more than 1,500 points, FIIs turned reluctant sellers. On 9th April, the index fell sharply in one last swoon. FIIs sold Rs664.90 crore worth of stocks that day, one of the highest net sales during the year. The Sensex dipped a shade below 18,200 the next day and shot up higher, in a straight line, recovering 2,000 points in the blink of an eye. 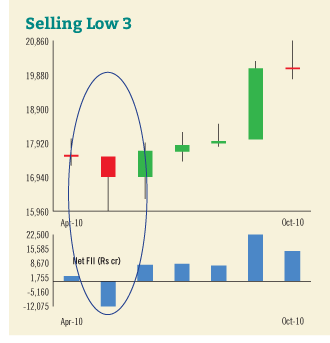 The FIIs had done it again—pressed sales at the market low. 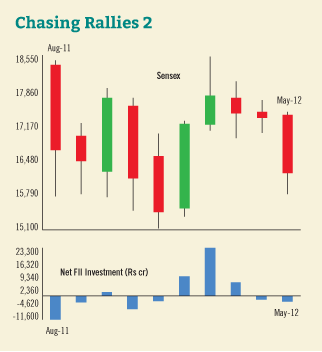 April, when the market made its recent low, also witnessed the lowest FII net monthly inflows of the year. We know that retail investors usually lose their nerve and turn into panic sellers when stock markets suffer sharp declines. Stock experts will tell you that that is exactly when you should be brave enough to buy. Maybe FIIs, the experts with nerves of steel, practice that? Well, not quite. Just as they chase rallies and put in the maximum investment near the market peaks, FIIs also press sales when the market is headed sharply lower. The above is just one such example. To be fair, often a fund can be a reluctant and forced seller due to redemption requests when the market is crashing. But often this is not the cause behind mass scale selling by FIIs. Hedge funds have clauses to prevent irrational withdrawals (called ‘gating’) by investors can that can affect fund performance. It might surprise you to know that there is usually a complete correlation between significant FIIs net sales and market bottoms, again and again. Take the extreme case of September and October 2008, when global markets fell off the cliff. 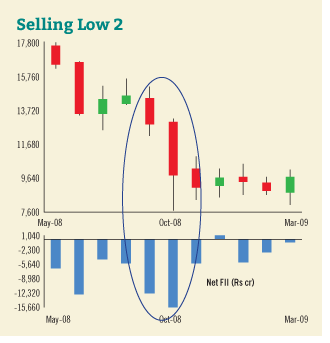 As the chart depicts, net sales by FIIs started July 2008, picked up a bit in August and turned into an avalanche in September and October 2008. The major market bottom? October 2008, as the Sensex hit 7,697 intraday on 29th October. 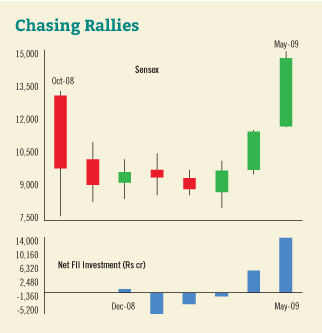 FIIs continued to bet net sellers virtually every month right up to March 2009 when from the first week of that month, a global rally was underway. In January 2010, as the euphoria of the Congress-led victory on 2009 elections started to wear off, the Sensex dipped below 16,000, making a low of 15,652 in early February. Not surprisingly, the FIIs were selling. Their net sales were a significant Rs7216.67 crore in January. Interestingly, their maximum net sales (like in April 2013), coming within days of the exact market short-term bottom. It was exactly the same story in May 2010, as the index, after a temporary rally to 18,000+, started swooning impacted by poor economic growth. On 25th May the Sensex made a bottom of 15,960 and then rose to almost 18,000 within a month. And what did FIIs do in May? Pressed net sales of Rs12,071 crore, the third highest ever and almost as big as their net sales in September 2008, when the global markets were imploding. The net sales of May 2010 were of course immediately followed by momentum-chasing (as described in the last piece). As the markets took off, FIIs scrambled back to investing Rs7,500-Rs8,500 crore per month for the next three months. It bears repetition, that this was just the appetiser. The FIIs rushed in with over Rs36,800 crore of net buying in September and October 2010, exactly timed with the significant market top of 21,108 on 5 November 2010, one that has not been surpassed till today! Finally, witness the FII investment behaviour in the second half of 2011, when another important market bottom was made. In August 2011, the euphoria of the late 2010 had worn off. Buying on the hope that quantitative easing by the US Federal Reserve would push up all asset prices was replaced by the reality of flagging corporate performance and interest rate increases in India, combined with the problem of Eurozone. The Sensex hit 15,765 on 26th August. Were FIIs significant buyers? No. Their net sales that month was over Rs11,500 crore. They continued to sell into December, as the Sensex hit 15,136. The moment the market rallied next month, momentum-chasing was in order with a climactic net buying of Rs23,236 crore happening in February 2012, the highest ever, as the Sensex hit a peak of 18,524 and headed lower. 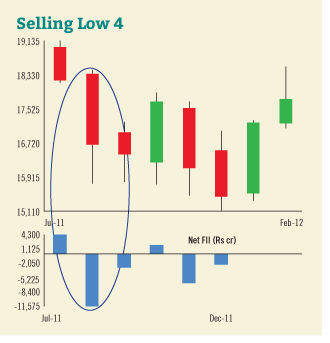 FIIs had again done their act of sell low, buy high. For almost two decades now, FIIs, treated like sons-in-law in an Indian home, have driven the Indian market higher so much so that their holdings of all blue-chip companies far exceeds the combined Indian holdings and are only a step behind the controlling group’s holding. In some cases like HDFC and HDFC Bank, they are, by far, the largest shareholder group. The laws that govern them are shady and remained so, under successive finance ministers—from the righteous Yashwant Sinha to Jaswant Singh to the stalwart of licence-control regime Pranab Mukherjee to command-and-control master P Chidambaram. FIIs are to be left alone. They can come and go, reveal nothing and pay no taxes—we need their money. We hardly know who these people are. Even when the market regulator was investing in the 2001 scam, foreign brokers refused to reveal the names of beneficiary FIIs. The powerful SEBI chairmen could do nothing. But fret not. No matter who they are, they are not smart enough to follow what some cool-headed individual, amateur investors are able to—buy good stocks when they are down and sell them when you need the money or when the market goes mad. FIIs do the opposite. Buying near the peak, chasing a rally to panic selling at the market lows, they act exactly as the average retail investor, the world over. As an investor, follow the FII data closely and take the other side when you see extremes. You may do better than them! 2. By converting equity to derivatives and vice versa. Buy Derivatives and sell equity and commit within limits-so these are the rules of the game being followed and exploitation of Indian Laws. It was vital to show that the markets would have peaked even if the FIIs had not invested thousands of crores, and also that the markets would have bottomed even if there were no FII outflows. Otherwise these same statistics can be used to build a case that the FIIs are the sole movers of the Indian markets. Good Analysis, but there are a few points which are beyond the obvious (those who have been following FII figures for last few years know that near market bottom the figures are big time negative and are hugely positive near the peak). So the first thing is if this is the real FII money (since beneficiary is still unknown in most cases) or is it the easiest conduit for routing the black money back in to India (this is where the real investigative journalism is required). Its naive to think that the big guns who are controlling the World Financial Markets for over a century now are so foolish as to always "Buy at top and Sell at the bottom"
Even out of the genuine FII money, buyers and sellers at peak and bottom are not the same. There are more than 1000 FIIs registered with SEBI so, its not always the case that FII A, B and C always are included in the buy figures at the top and are again there in the sell figure at the bottom. Even within the FII there are many categoreis like Proprietory funds of big guns like Goldman, Morgan Stanley, JP Morgan, than their clients money, hedge funds, Pension funds, University Endowment funds etc. Some of them by their mandate have to be conservative, some are momentum chasers, and some of them are market movers (who create the bottoms and tops because of their vision about the economy etc - that's where the saying comes that markets always discount everything way ahead of the actual economic top and bottom). Its also naive to think that those FIIs who are in the country for last 20 years are always loosing money (by buy high sell low philosophy). If that was the case they would have shut shop many years back having lost all of their proprietory or clients money. Some of them are headed at local level by Indians only and have mastered the art of manipulating stock price movement (if not the whole market) in connivance with local big guns (firangi fire power with local tactics in desi flavour). Lot of these Indian big guns have mastered the art of giving interview on different media channels like "India is a in long term structural bull market" while pressing sell button in their proprietory portfolio and vice versa. How insignificant India is for most of the first world countries can be judged by the amount of coverage the local papers give there-hardly one small paragraph in the whole newspaper.You are right.Genuine FII's are very very few. I think writer lacks basic knowledge of market. FII main money is in fno and they buy futures at bottom and short futures at top and you cash stocks for reversals. Simple lacks at indian media i guess. Just to counter your claims, this is posted today on bloomberg's home page. Yr statement proves the hollowness of yr thinking. Moneylife's analysis and opinion of Indian equity markets is better than anyone in India. Its foolish to say that that FIIs are only buying futures & options and using the cash market for hedging. Their holding in Sensex stocks are at an all-time high. Besides, we have reviewed many FII portfolios. Many poor quality stocks, mid-cap stocks not in F&O. Be a little less presumptuous, if you want to know facts. Language sounds very similar to that of Mr.Basu . . . Disagree. On the contrary, there is lack of basic knowledge about the author. If someone wishes to move money with a thought of raising as little noise as possible he would move the money into loss making venture. Tell me, who would try to investigate a loser (no one imposes tax on loss anyway). And FII's appears to be doing so everytime. Now who gains appears to be 'public' in the stock market. But clearly those who trade the largest amount of shares (the big guys) can always rake the maximum share. Their gain is legal and everyone knows that the burden on this earning could be as low as mere STT. Isn't this a wonderful scheme for converting black money stashed abroad (into dubious FII's) into white money in hand (partners of big guys). And if FII's and (big guys) are in league, they can very well beat the 'aam public' while at this game. I still cannot guess whether or how they can beat the 'analytics' set by top fund managers. A lot of FII money is hedge fund money that buys momentum. A lot of time you can buy high and sell higher. Just look at the Dow. Many times such bets go wrong these guys exit in a hurry. We pointed our yesterday that the maximum investments by FIIs (foreign institutional investors) came when the index levels were near their peaks. In most cases, after the FIIs have rushed in with massive investments, the subsequent performance of indices has been below average. The peak of 2010 November has still not been surpassed while the two months prior to that witnessed the largest two-month burst of FII investment ever. The large investment after the market index has run up a lot is a sign of what is called performance-chasing or momentum-chasing. This happens after the market has turned around and run up against the prevailing wisdom. Investors who were out of the market suddenly feel left out. Institutional investors have a bigger problem. They are held accountable for performance vis-à-vis a popular market index like the Sensex or Nifty. When these indices take off, they feel compelled to chase these indices so that their performance does not suffer. This is why not only have the largest monthly FII investments have been timed with medium-term market peaks, but many large monthly investments have also come well after the market bottoms, trying to play catch up with the rally. The opposite of momentum-chasing happens when the market is sliding. At those times, momentum-chasing takes the form of selling. Here is some data of both kinds. In October 2008, it seemed that the world would come to an end, as the global financial crisis reached its climax. Investors were shell-shocked at the ferocity with which the market had declined in a few months. For months thereafter the aftershocks were visible. FIIs were selling almost every month, quite understandably, because they were unsure of the future. However, almost all global markets made a low in early March 2009 and embarked on a massive rally. FIIs, who like retail investors, avidly watch prices (formed by millions of others) to decide what they should be doing, were net sellers even in March 2009. By April the Sensex was over 11,400, from over 9,700 in March. Did they see a train pulling out of the station? In April 2009, FIIs invested Rs5,560 crore, an average month, by their normal standards. In the third week of May, the Congress-led government came to power, which made the Sensex shoot up to over 14,600 by the end of May. The train seemed to be certainly leaving the station now and the FIIs couldn’t miss it at any cost. They invested almost Rs14,000 crore that month—well after the Sensex was up from March 2009 lows and exactly timed with the sudden market momentum. In September 2009, as the market trended higher, they invested over Rs13,3000 crore. But chasing momentum irrespective of valuation levels can often be disastrous. The very next month of this huge investment, the Sensex promptly fell below 16,000. Evidence of performance- or momentum-chasing is pervasive. In August 2011, the Sensex was around 18,200 when the Eurozone crisis erupted. The market fell and the FIIs turned sellers. As the market headed lower they were not buying. They were selling in a market that was already low. In November and December 2011 when the index was at around 16,000 FIIs were net sellers after turning marginal buyers in October. But when the market picked up in January 2012, the upward shift in momentum had FIIs scrambling to be net buyers, leading to the mother of performance chasing—the market peak in February 2012 when they put in their highest monthly investment ever—Rs23,236 crore. By May 2012, when the Sensex was down below 16,000, FIIs were selling! The best examples of momentum-chasing can be found in a rising market. When the market declines, FIIs usually stop buying. When it hits 52-week or multi-year lows, they sell. This is what happened in May 2010. As the Sensex headed towards 16,000 from over 17,500 the previous month, FIIs pressed net sales of a huge Rs12,071 crore worth of stocks. Retail investors jump in at the peak, buy when the market has run up and sell when the market has fallen a lot. FIIs seem to be prey to a similar behavioural pattern. They also do one other thing that retail investors do—panic selling during a severe market decline. We will look at that in the third and last instalment of this series.